Last night I paid my first visit to waterintobeer, the Brockley shop/bar for all things beer - big selection of bottles and cans as well as homebrew gear for those who fancy doing it themselves. And DIY is a big part of the approach of the shop, owner Tim Livesey says he is inspired by his life long punk devotion: 'I mention this as the parallels between the DIY punk community and the brewery community seem blindingly obvious to me; people helping each other out, creating networks away from the mainstream, creating inspiring ‘products’ and just being generally ace. All because of a passion for something that they love; something that they believe in, something that means something'. Similar arguments too about commercialism and selling out to big labels too, as Tim notes. You can take drink away or stop and enjoy it on the premises in Mantle Road (next to Norbert restaurant, formerly Noak), they usually have something on tap too. I was there to see my friend's band Devil's Doorbell playing as one of the acts in Acoustic Anarchy, a monthly acoustic night. They did a funny song poking fun at (ex? )anarchists who've joined the Labour Party called 'Big Rock Corbyn Mountain'. 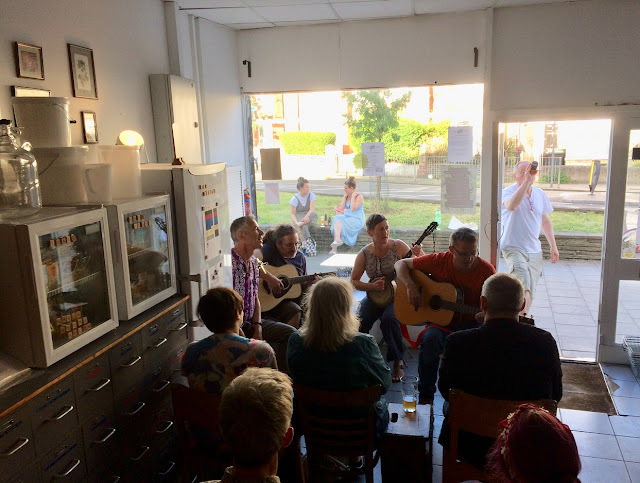 This time round the night was also part of the Brockley Max festival 2018. There's still another week to go of music, art, theatre and other events in SE4 - check out the full programme here. Next music event at waterintobeer is on June 30th, with Cath Roberts, Tom Ward and Colin Webster presenting another of their BRÅK improvised nights. Facebook event details here.